Nicely situated apartment perfect for what we needed. My friend and I stayed here for 4 days and both the bed and the fold down couch were very comfortable. We basically just slept here and spent all day out wandering around town. It is in an older building and definitely has some classic NYC walk-up characteristics (narrow halls, small spaces, lots of stairs, weird smells) but the apartment itself is clean and quiet and larger than I expected. It was a perfect location on the lower east side, close to the F train, food, great nightlife, ATMs, bodegas and basically everything else you can think of. Best of all, it has a great little AC unit that not only worked like a charm but was just noisy enough to fill the apartment with white noise to drown out street sounds. The only cons for us was the water pressure in the shower was unpredictable depending on what the neighbors were doing (we assumed) and we did kill a few little roaches. Perfect for sleeping in a fun, safe and awesome neighborhood. My friend and I both agreed that if we had been planning on hanging out for extended periods of time during the day we probably would have wanted something a little fancier, but since we were there to see the city it was exactly what we needed. The apartment was cozy and cute. 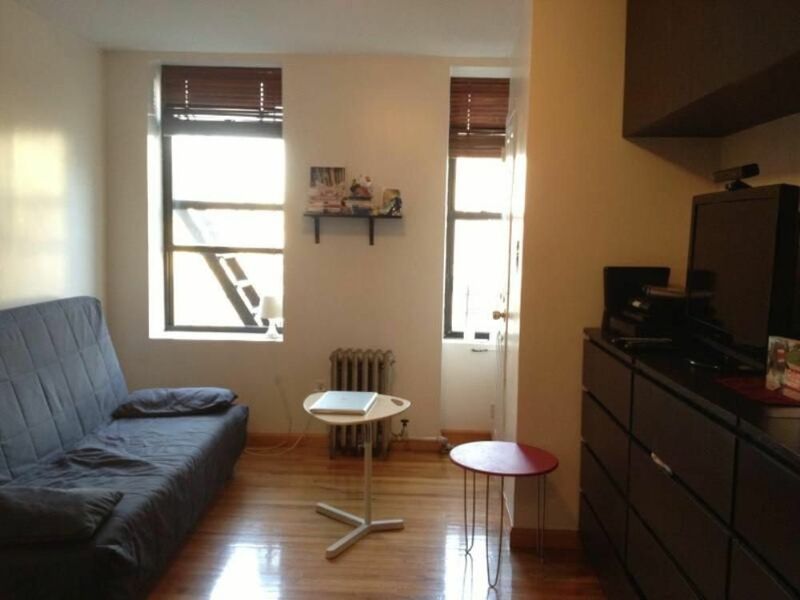 It’s in a perfect location, and the subway is right around the corner. Maki was extremely helpful and responded quickly. I can’t wait to come back! Unfortunately the property is quite dirty. It's very small which was expected however not clean. We had clean linens but the floors were gross there was dust in corners that had obviously been there for quite some time we spotted and killed 1 roach. In addition there was no light in the bathroom the blind in the bedroom was not hanging when we arrived. My husband was able to fix it. The building was filthy the halls smelled bad and outside was a little scary. Just as described. Small, quaint and clean. Nice little apartment. Noise did not bother us at all. Had a little problem getting in, but a nice neighbor helped us figure out the locks. My only thing for others to know is the stairs. It was very difficult on my mom who is almost 70 to climb the 3 flights of stairs. The apartment had everything we needed and access was well organised.
" Restaurant huge variety of restaurants bar and fashion stores. Food Market: essex market one bloc away offering natural fresh foods.